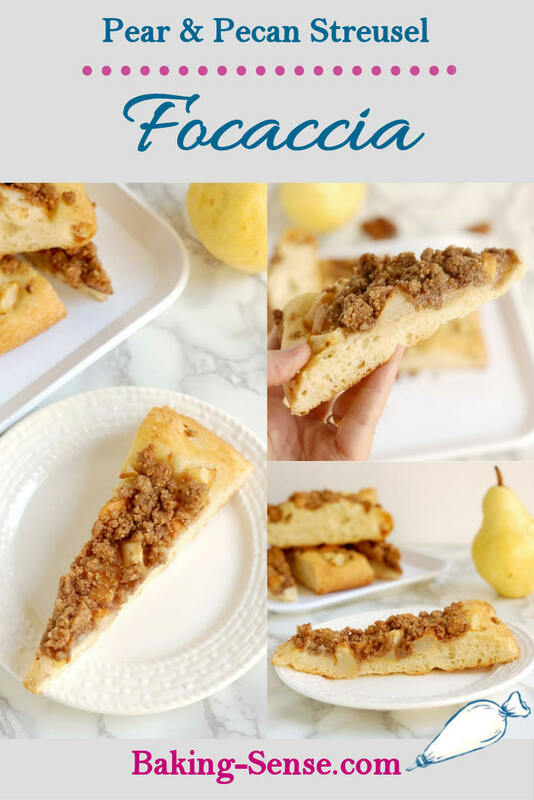 Pear & Pecan Streusel Focaccia is great for breakfast, brunch or snack-time. 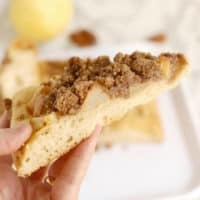 Airy, chewy focaccia bread is lightly sweetened with a topping of fresh pears and brown sugar-pecan streusel. I’m so happy to be working with the folks from Red Star Yeast once again. I’m a big fan of their products and I love the recipes on their website. When I was asked to create an original recipe for them I knew I wanted to make a bread that could be served for breakfast or brunch. 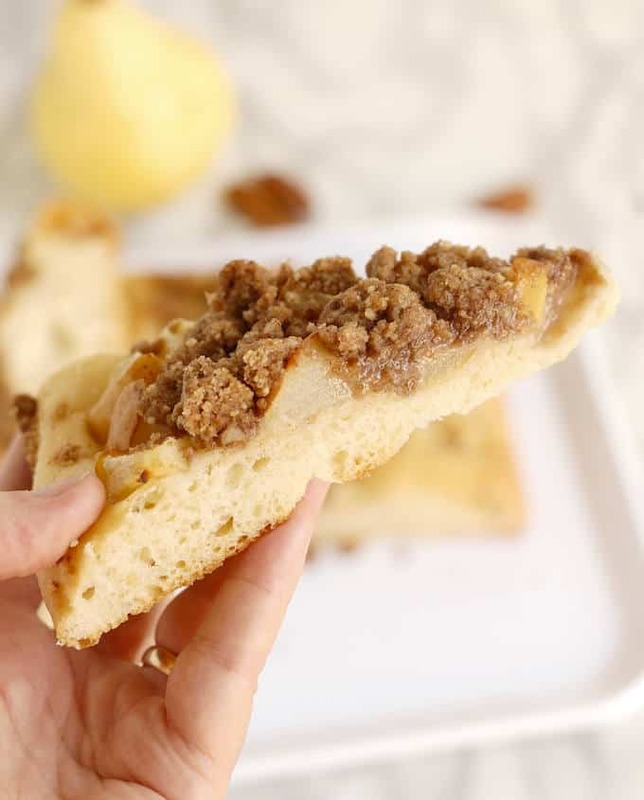 This Pear & Pecan Streusel Focaccia is a cross between a flat bread and a coffee cake. 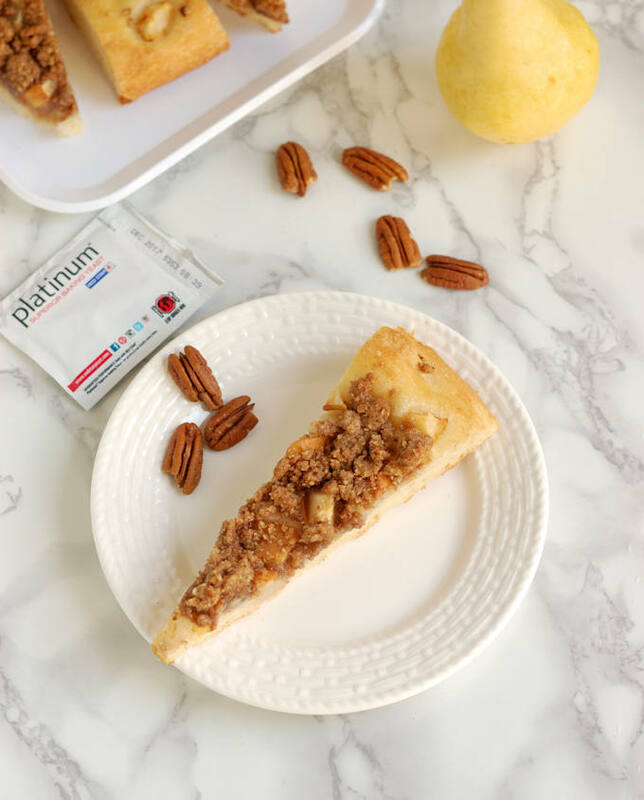 The bread base keeps the whole thing from being super sweet, and I just love the combination of fresh pears and lightly-spiced pecan streusel. The flavor combination would be perfect for a holiday brunch party. 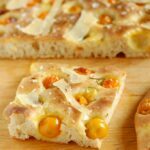 Because the dough can be started the night before, you can enjoy fresh, warm focaccia for breakfast or brunch, and you don’t need to get up before dawn to make it. I used a packet of Red Star Platinum yeast in the dough. Red Star Platinum Yeast contains dough enhancers which strengthen the dough and make the yeast more active. A stronger dough will give you more “oven spring” because the stable gluten network does a better job of retaining the air bubbles, and a good focaccia is all about the air bubbles, isn’t it? 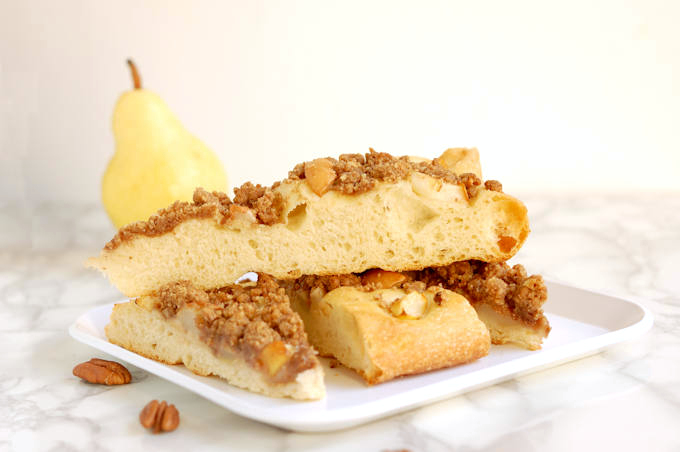 Watch the recipe video to see how to make Pear & Pecan Streusel Focaccia. To find more recipes and baking inspiration, check out Red Star Yeast on Instagram , Facebook, Twitter, Google Plus and Pinterest! Disclosure: I was financially compensated for this post. The opinions are completely my own based on my experience. 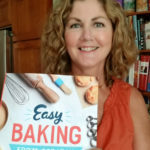 Thanks for supporting the brands and companies that make it possible for me to continue creating great recipes for you. 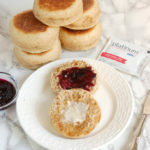 Great for breakfast, brunch or snack-time. 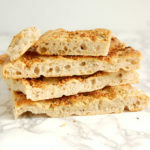 Airy, chewy focaccia bread is lightly sweetened with a topping of fresh pears and brown sugar-pecan streusel. Combine the water with yeast, oil and salt. Add 2 cups of the all purpose flour and mix to combine. Switch to the dough hook and add the remaining all purpose flour. Knead on medium low speed for 15 minutes (speed 3-4 on my stand mixer). 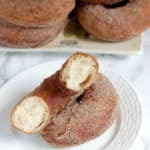 The dough will be quite sticky but should also be very stretchy and will cling to the hook and clear the sides of the bowl. Scrape the dough into a lightly oiled bowl, turning once to coat the dough. Cover and set aside in a warm place to double in volume, about 1 - 1 1/2 hours. 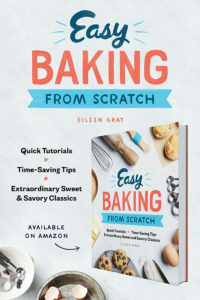 Knead the dough, return to the bowl, cover and refrigerate overnight. Meanwhile, to prepare the steusel put the pecans, both sugars and the spices into a food processor. Pulse until the nuts are ground to small chunks. 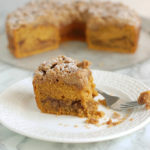 Add the butter and flour and process until the streusel forms large clumps. Lightly brush the top of the risen dough with egg wash to help the toppings stick. 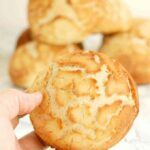 Use your fingers to dimple the top of the dough all over. 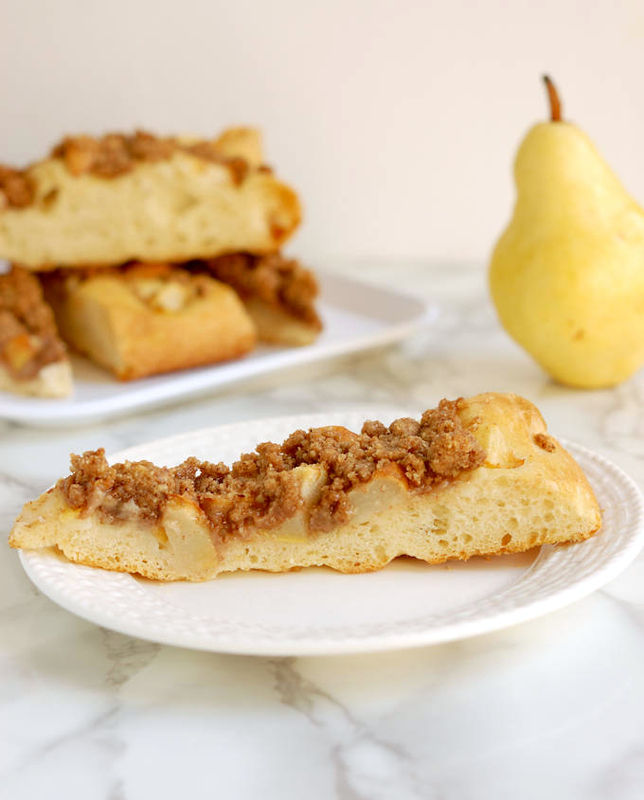 Press the chunks of pear into the dough, spacing them evenly over the focaccia. 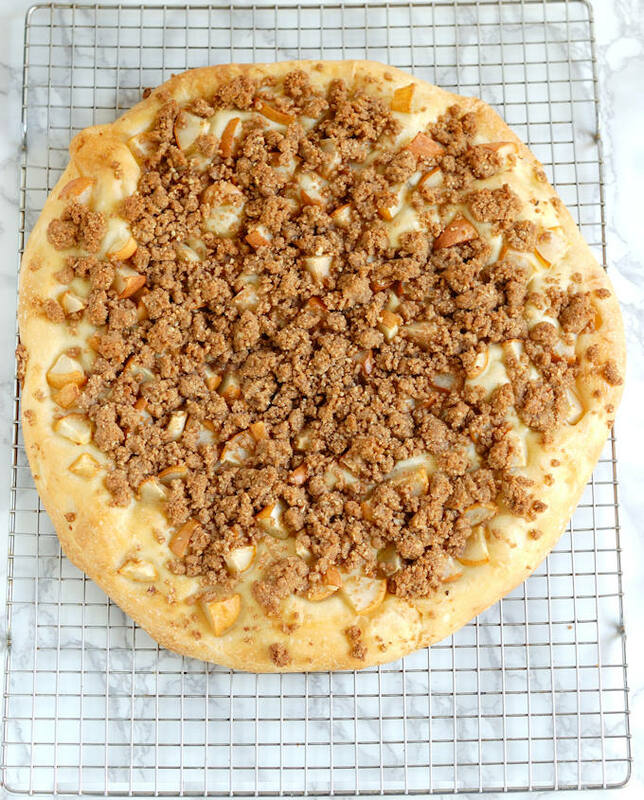 Sprinkle the streusel evenly over the dough, breaking it into small clumps as you go.